I’m getting a little anxious about the biggest issue with this boatyard: getting supplies. Will I get the paint and resin I need? What if I don’t have the correct bolts and screws? What about food?? We’re in the middle of the Tuamotus archipelago, a remote group of atolls 200+nm (nautical miles) from Tahiti. The boatyard itself is 10 nm east of the village, which hosts about 250 inhabitants, and whose one store runs out of onions. I can’t imagine a more isolated facility. So why haul out here? For one, I am really curious, how does this place even exist? My romantic penchant for remoteness is intrigued. On a practical level, we love diving in the Tuamotus so much that it seems beneficial to use this yard when possible — and avoid the taxing upwind sail from Tahiti back here. 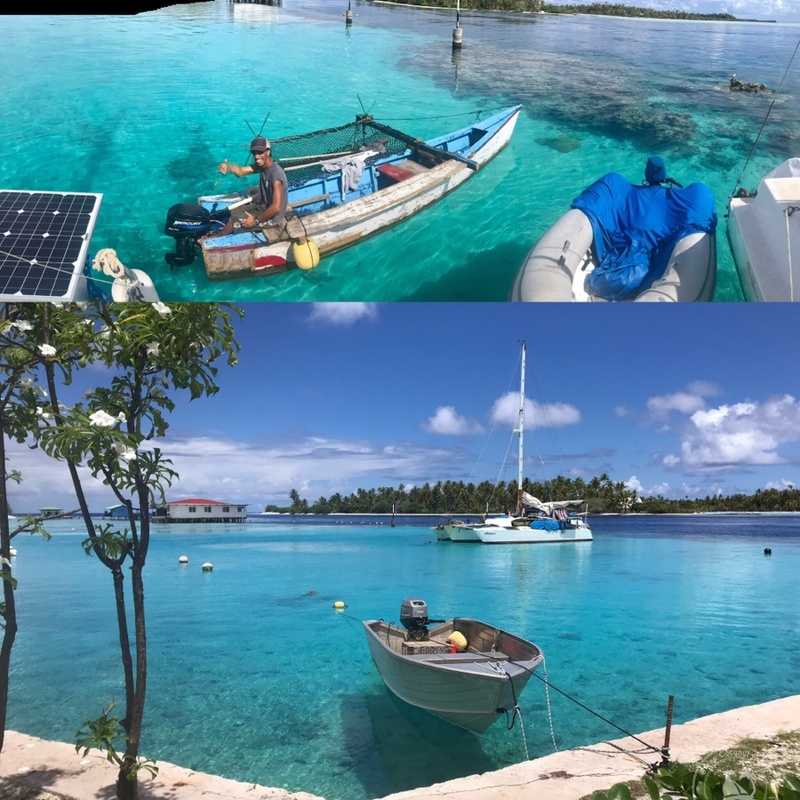 Also, it’s much sunnier & drier in Tuamotus than Society Islands, which makes working on the boat easier. At this particular moment, it seems like a bad feature, because it’s deathly hot. The calm conditions makes for great diving, but I’m unsure about being in protective suits & respirators covered with sanding dust. Sigh. I’m hoping the trade winds return and freshen things up. ← Who needs sailboats… when there’s vans and drones? How is Apataki, Tuamotus like Olympia Brewing Company, Washington? “It’s the Water!” There is nothing like the impossibly transparent, infinitely multiblue toned water of French Polynesia. Whenever you like, the plunge that refreshes, a visit to the sea life-thick aquarium beneath and a long, cooling core body temperature reduction. We empathize with learning, “Yes, we have no onions”. But tomorrow is another day, the supply ship will arrive with support for the long awaited haul out. Well said! “It’s the water” and importantly, what’s below it. There is a whole beautiful universe underwater, which makes the above-water discomforts seem entirely worthwhile. Which of course includes what’s below. Except in rare circumstances, perhaps. The slogan of a Milwaukee brewing company (I forget which one) was “The Beer With the Body”. A good one, until the day it was summarily discontinued. This was the day a body was discovered in one of the company’s huge vats. As it appeared all over the newspapers and on everyone’s lips, the slogan acquired an unfortunate double meaning. Second, oh my goodness the heat…the way you’re describing that strips the skin off my bones, I melt in the heat and am very sympathetic to what you’re describing. Hugs my man, there is no way any of us could do this without you, including the living vicariously part. “Pay it forward”. Well said, Brian. Already we see it is widespread within the community of greencoconutrun, and one we think should spread well beyond.